As a representative of 13 abbots or teachers at Buddhist institutes in Rumtek and New Delhi, India, I write about TIME magazine’s coverage over the past several years of the controversy surrounding the recognition of the Karmapa, who is the head of the Karma Kagyu lineage of Tibetan Buddhism. Ever since a story published in your May 2, 1994 issue, TIME’s reporting about this matter often has been ill-informed, inaccurate, and even biased. inaccuracies are reported or important information is omitted. Because we have witnessed many of the events reported in your magazine about the Karmapa, we have solid reason to question key points in TIME’s reporting. In the past it has not been our way to refute or attack press reports that are factually untrue or unfavourably biased. We are confident that we have the truth and facts behind us; so we have tried as much as possible to keep things uncomplicated. We are spiritually, not politically, motivated. However, we now realize that the time has come to support our case in a more proactive way. We are not naive enough to think that misinformation will ever be totally controlled. However, we will certainly try to show how people are easily influenced by information that is inaccurate, biased or misleading. Further, we shall in the future point out any inaccuracies that are published by your magazine and take action should anything be published that is slanderous and damaging to our credibility. We are prepared to submit documented proof if need be. To demonstrate the errors and misleading information contained in your reporting, I attach a copy of your May 2, 1994 article “Battle of the Buddhas” plus a refutation and correction of many statements in the article. It may seem strange that we focus on a six-year-old article, but many of the inaccuracies and biases reflected in it have been picked up over the years in other press accounts around the world. For example, this article is the first to mention that the Karma Kagyu lineage has assets totalling $1.2 billion. 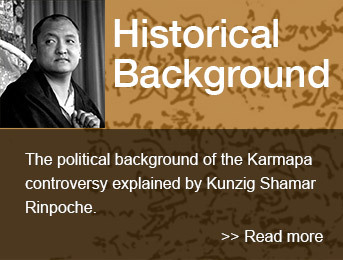 While this figure grossly exaggerates the value of the lineage’s holdings, it has been quoted several times over the years and has caused people to suspect that we are pressing the case of Thaye Dorje as Karmapa for monetary reasons. Another example of egregious bias occurs later in the article when your reporter mentions how the welcoming ceremony for Thaye Dorje turned into a “melee” (see point 9 in the attached document). Your reporter was present at the event yet failed to mention the fact that the melee was instigated by Tai Situ Rinpoche who brought in busloads of rock-throwing opponents to disrupt our ceremony. In conclusion, we appeal to you as the Editor-in-Chief of TIME to ensure that your reporters research in greater depth and report both sides of the controversy. Upon request we shall be pleased to supply your them with relevant documentation substantiating the recognition of Thaye Dorje as the 17th Karmapa and with backgound information about the Karma Kagyu lineage.